Programmable thermostats have many benefits, which is why the team at JP Heating & Air Conditioning in Kalamazoo strongly recommends them. In this post, we will look at four of the reasons you should use a programmable thermostat in your home. The number one benefit to using a programmable thermostat is the money saved in heating and cooling costs. With almost 50% of a home’s energy going toward heating and cooling, it’s important to do everything you can to keep these costs as low as possible while still feeling comfortable in your home. When you have a programmable thermostat, your energy usage is reduced by increasing your set temperature in the summer and decreasing it in the winter when you’re away or asleep and keeping to a consistent schedule. For every degree you raise or lower your thermostat, you save around 1% on your utility bill. When you have a manual thermostat, you end up spending a lot of time thinking about adjusting the temperature as well as actually adjusting the temperature! With energy saving in mind, you have to go to your thermostat when you leave your home and when you come back as well as when you go to bed and when you get up. 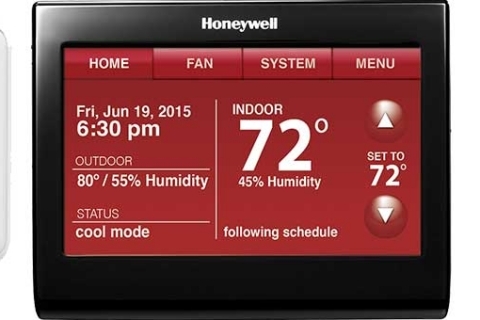 Using a programmable thermostat eliminates the need for all of that time spent in front of a traditional thermostat. Most new programmable thermostats come with WiFi capabilities that allow you to control your thermostat from your smartphone or computer. This technology is really great for those who go on vacation or are away from home often. If there are big temperature swings back home, you can adjust your thermostat accordingly. Many utility companies offer $10 or $100 rebates to upgrade an old thermostat to a programmable or WiFi thermostat. ©2019 JP Heating & Air Conditioning All Rights Reserved.